Today’s recipe is for soft molasses sugar cookies. 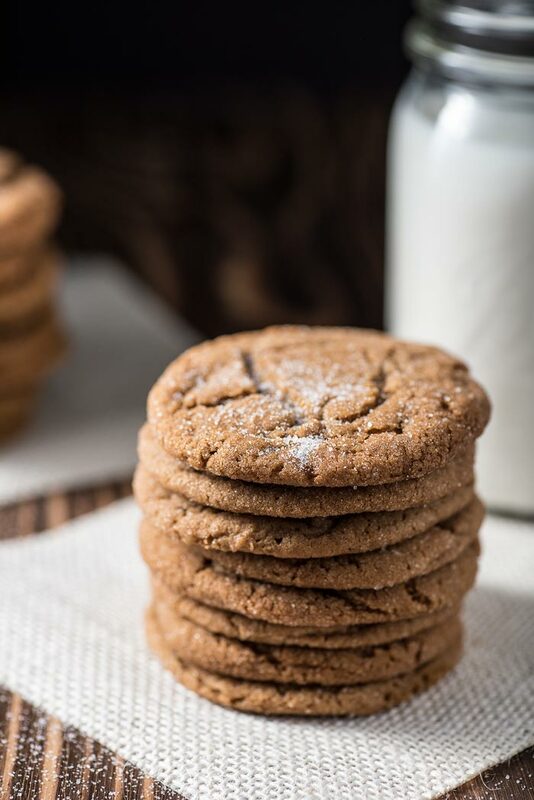 They are so good and they remind me of my grandma’s molasses cookies. 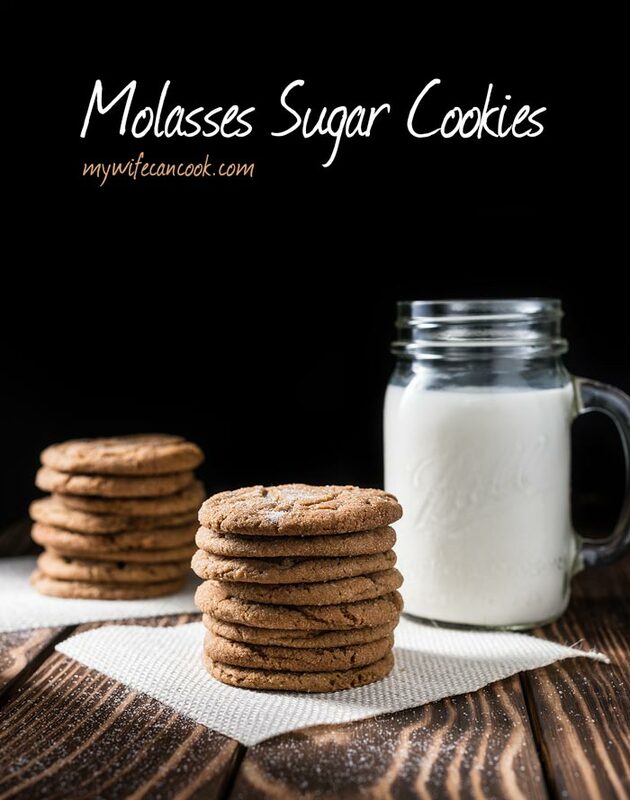 Read below for the recipe details and I bet you’ll be adding these molasses sugar cookies to your holiday cookie must have list. Both of my grandmothers have amazing molasses cookie recipes. On my mother’s side, my grandmother’s molasses cookies are dark brown, chewy, and delicious. On my father’s side, my Grandmother Joyce’s cookies are a molasses cookie with traditional gingerbread spices and are rolled in sugar. Unfortunately, she passed away when I was young, so I don’t have a good memory of these cookies, only the way I have made them. How do you keep your cookies soft? With these cookies, the key to keeping them soft and delicious is not to over bake them. So if you are going for soft molasses cookies, keep a close eye on that oven and pull them out before they overbake. 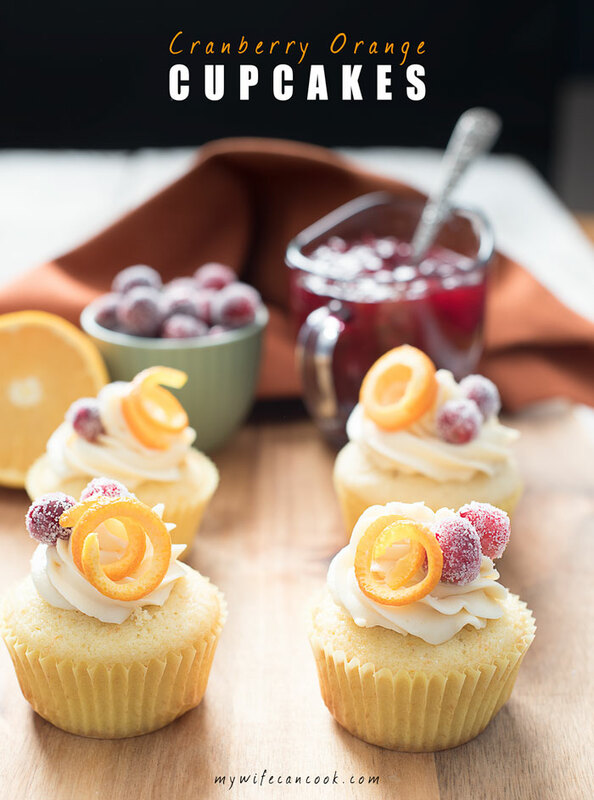 But for other recipes, remember it’s not just about baking time, but also the overall ingredients. Soft cookie doughs usually have more moisture. 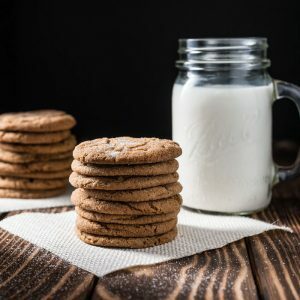 I’m sure the molasses plays a role in this recipe — for other recipes, if you’re struggling to get your cookies as soft as you like, figure out how to get more moisture into your dough by tinkering with your ingredients and/or ratios. This recipe calls for ginger, cloves, and cinnamon. Three of the main spices in gingerbread spice mixes. It made the whole house smell Christmas-y and made me crave a gingerbread spice latte or a gingerbread cookie. If you or your family aren’t fans of ginger and cloves, feel free to leave it out. I think it would still be an amazing cookie with just the cinnamon. I personally love the combination, and always associate memories of making cookies with family at holiday time. I need to break out these spices more often and try something like this vegan gingerbread cake. or this overnight gingerbread french toast bake. 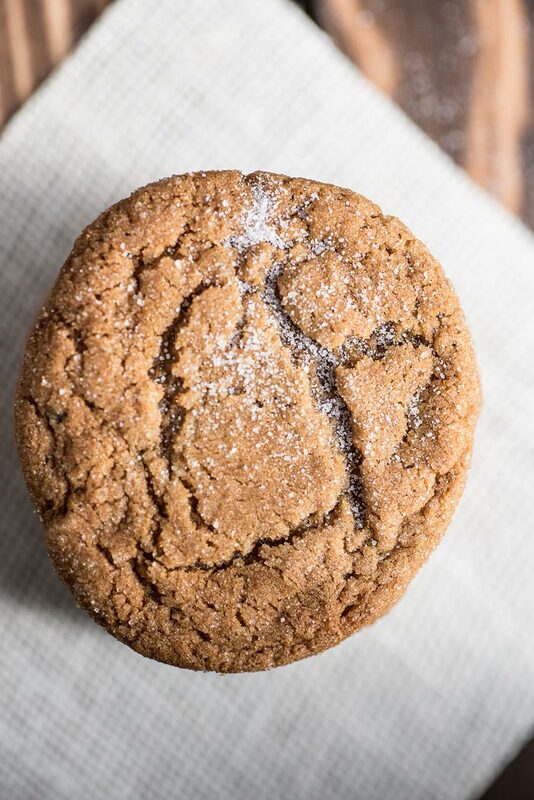 What’s the difference between these molasses sugar cookies and a gingersnap? About two minutes. No, really, if I don’t catch the cookie at the right moment–still soft and slightly undercooked in the center and quickly removed from the oven–they end up hard and more like a gingersnap. Which is great too, but we love these soft so, as mentioned above, watch your cookies closely. The original recipe calls for shortening, but I don’t use enough to buy and keep shortening in my pantry, so I switched to butter, and it seems to work fine. I did read that if you are making gingersnaps, you should use shortening because the butter is key to keeping a cookie soft. I use insulated cookie sheets for baking cookies. I’ve read that this alters the time for baking, but I have found that it bakes cookies more evenly. I need to test out some good regular cookie sheets, but am not a fan of most of the ones I find in stores. My mom has an amazing set, but I think a family friend, who was a welder or sheet metal expert, made them. In other words, not something you can easily pick up. On to these soft molasses sugar cookies! We hope you love them as much as we do. A molasses cookie with gingerbread spices, rolled in sugar, and removed from the oven soon enough to keep them soft and chewy. Mix in molasses and egg. 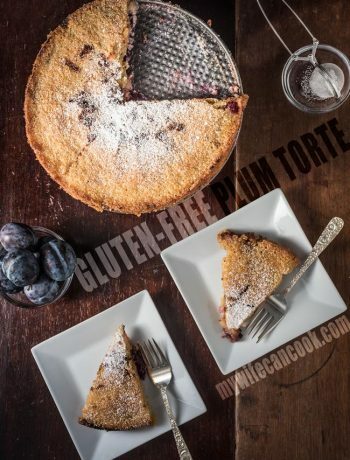 Combine and stir dry ingredients: flour, baking soda, sugar, cloves, ginger, cinnamon, and salt. Scoop cookie dough with a tablespoon and roll into balls. Refrigerate balls for at least 30 minutes. Roll cookie dough balls in extra sugar and place on cookie sheet. 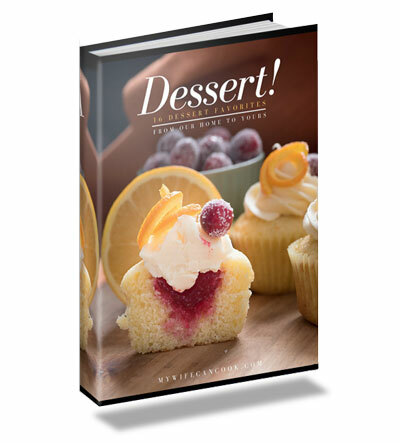 This is Definitely going on my Christmas baking list! 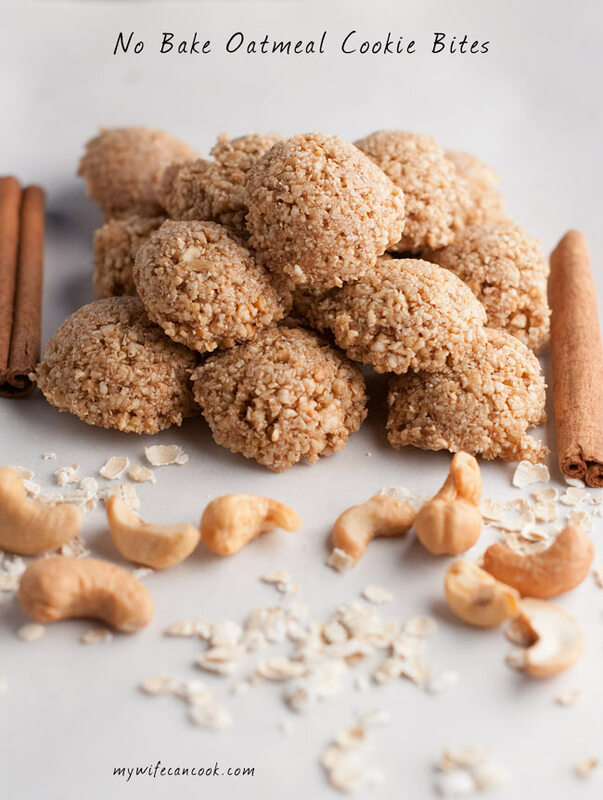 I love that the recipe is so simple and it’s 2-in-1 also 🙂 remove half first for soft cookies and remove the other half a few minutes later for gingersnaps! Thanks! It is a good 2-in-1! Hope to hear from you .. would love to make these .. The one cup of sugar was mixed with the butter in step #1. Bad word choice probably for step #3. I should probably have said remaining dry ingredients.